Called "The Fair Lady" by her attendant Eingyi, she is nameless, but players have given her the name Quelaan. She is the saint of the Chaos Servant covenant. Blind, weak, and on the verge of death after swallowing the blight pus of the residents of Blighttown, she is completely immobile and was made the Fire Keeper of the nearby bonfire to keep her alive. Her speech seems incoherent at first (just '…? '), but with the Old Witch's Ring equipped, you may converse with her normally. She mistakes you for her sister, Chaos Witch Quelaag, as she is blind and confused, and Quelaag was the only one who visited (and could talk) to her. This unnamed Daughter of Chaos once lived with her mother - the Witch of Izalith - and her siblings in the ancient city of Izalith. After the Flame of Chaos incident, her mother and many of her sisters were transformed into nefarious demons. She and her sister Quelaag escaped the worst of it; their lower torsos were mutated into giant arachnoid abdomens by the flames, but their upper bodies and their minds were seemingly unfazed. Fleeing their deranged, demonic kin, they climbed upward to the base of Blighttown and fashioned themselves a home. The precise details of what came next are only suggested at and implied by Eingyi. 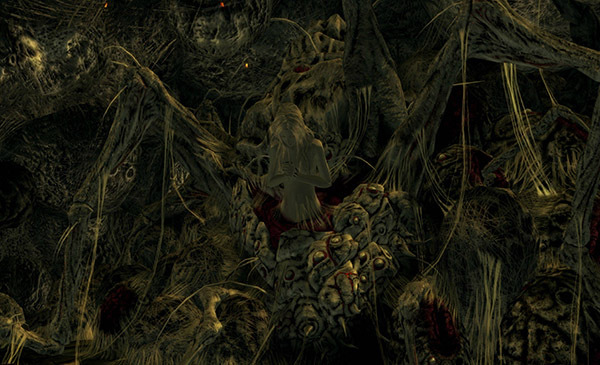 The Daughters of Chaos brought afflicted denizens of Blighttown with them as servants. Quelaag was unmoved by their suffering, but the Fair Lady wept for them. Overwhelmed by empathy, she did the only thing she could to help: she swallowed their blight pus, despite orders against such action from Quelaag. This cured the undead, but left the Fair Lady in her current state - perpetually near death, surrounded by eggs that will never bring life, and now, due to the actions of the player, completely and utterly alone. Behind the illusory wall below the second Bell of Awakening. Using Seek Guidance will make a developer message appear pointing to the illusory wall. Allows you to join Chaos Servant covenant and upgrade its level. Like any other Fire Keeper, the bonfire becomes unusable when she dies, although it can still be warped to. She helps complete Sir Solaire of Astora's questline with him alive. See page for alternate strategies. As she's the reason the Chaos Servant order exists, killing her breaks the covenant and makes Eingyi hostile. It appears that feeding her Humanity improves her health. After a certain point, her spider limbs begin moving with strength and fluidity, rather than weakly and slowly. She also stops using the talk dialogues where she fears death ("the eggs have stopped moving" and "I wish I could see your… face one more time."). Oh my dear sister. Do not mind me, it does not hurt terribly. I'll be fine. I have you, dear sister. But promise me… that you will take care of yourself. Sister… It hurts… the eggs have gone still… I fear it may be too late… I'm so sorry, dear sister. Goodbye Quelaag. Do be safe. Goodbye Quelaag. It was so very nice to chat. Quelaag, what was that? Is something troubling you? After destroying the Bed of Chaos Report: This dialogue has been observed directly after defeating Quelaag and dying to Ceaseless Discharge. Queelag? Please, sister, do not cry. I am happy, truly. I have you, don't I?